How are you? All good I hope. 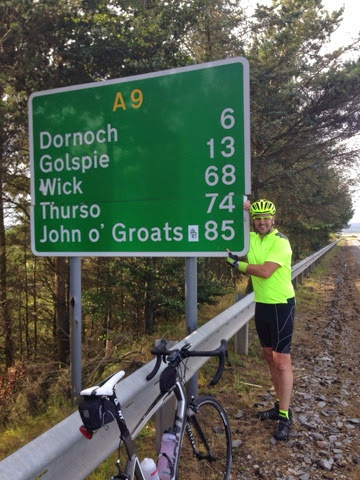 Well, it's finally here, my last ever LEJOG post, and it's been a journey, hasn't it. I'm glad I had you along for the ride. 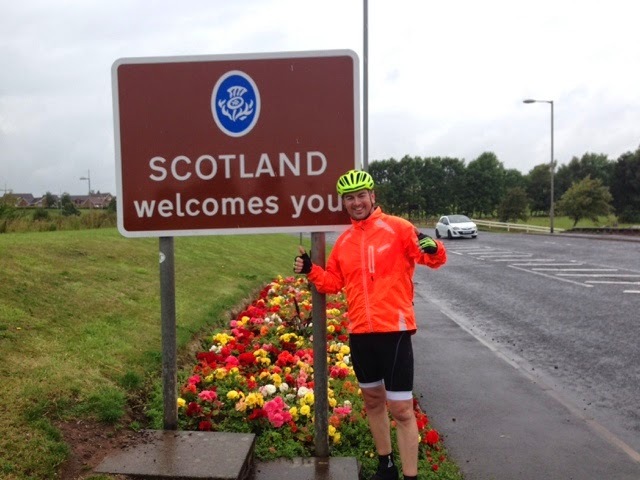 Firstly I should update you on the final day of the LEJOG adventure before I conclude on the journey as a whole. It was great to wake up on the Thursday morning with nothing to do, the lingering threat of another lycra clad day had faded along with the fog and pouring rain the night before. There was time for a leisurely breakfast (12 pieces for £6!) 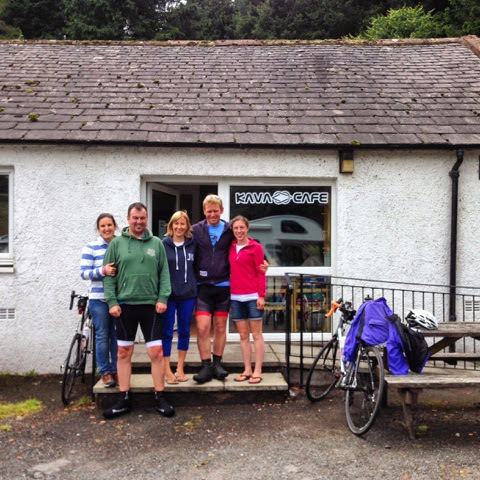 before we all said our goodbyes and made our way from John O'Groats to home - the SatNav read 750 miles to go! Carla and Helen shared the driving as Rob and I provided entertainment from the back (after a quick post-breakfast snooze). 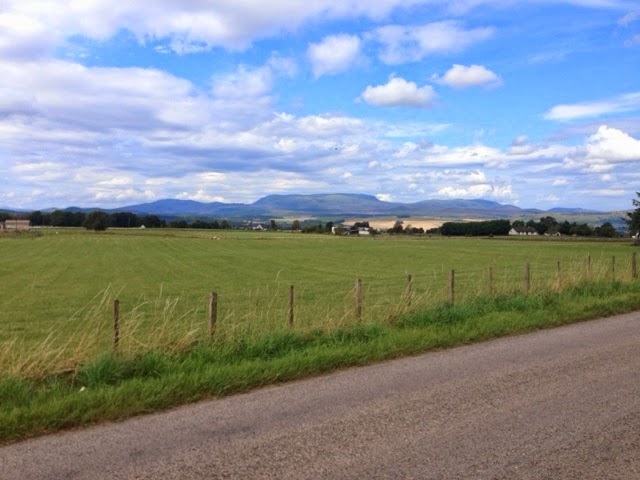 It was strange seeing all of the miles unravel so fast, day 10 then day 9 were quickly reversed as we stared out of the window at the fantastic Highlands countryside. I guess at this point you might expect me to say that I felt sad it was all over or perhaps a feeling of anticlimax, but I didn't, it was just an overwhelming sense of relief, like a weight that had been sitting on me for the last 6 months had been removed. The responsibility of the ride felt heavy and had weighed on me for some time, I was worried that my body would give up on me (particularly my knee or latterly, my achillies), so I was really pleased to have completed what I set out to do, for earning the generous support and sponsorship we had been given and for the first time in a long time, I felt I could properly relax. Mission Completed! I must pay tribute to Carla and Helen, not only were they fantastic during LEJOG, running around after us, making food, cleaning up, doing this, doing that, they barely got a minute to themselves and at the end of it all, they drove for 16 hours to get us back home in the early hours of Friday morning. Quite simply amazing - this tune is for them! So from the vantage point of John O'Groats, looking back over the last six months, what was running through my thoughts? How do I sum up the ride of our lives? Was it as we expected? I can tell you, unequivocally, it was incredibly tough. I put in so much training, many 100 mile cycle rides that went very well, but nothing prepared me for some of the physical torment I would suffer. Having to stand and cycle for the first few miles of several legs because I was too tough and stiff to sit and pedal was incredible. I'd suffered cramps before in the past, but the amazing pains I would suffer in my quads that made it almost impossible to turn my legs over. 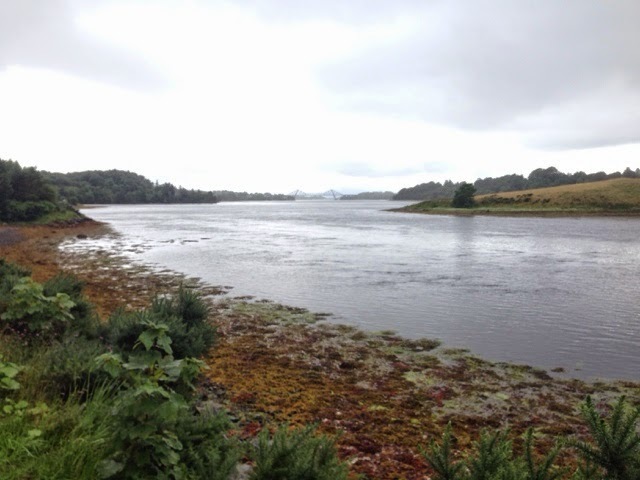 The soreness and stiffness in both of my achillies that meant I staggered and limped on the rest day in Inverary. None of these pains and aches were as I anticipated, they were more severe and I was scared they may put a premature end to the adventure. You could be forgiven for thinking that with two people smiling down on us the road would be a little easier, a little flatter, a little kinder, but it wasn't. 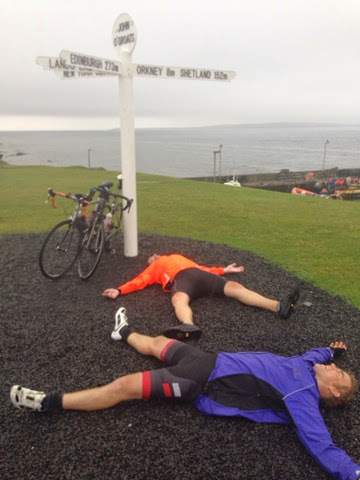 An accident on day one, huge hills in the early days, driving rain and wind in the latter stages and thick menacing fog on the last day, LEJOG didn't roll over for us, we had to earn it, every single mile, every single foot of climbing. I'm glad we did, the pain and the hardship made it a worthwhile challenge, it was a genuine test, it was worthy. I'm delighted and relieved we overcame it. There are a few more strands to the story than that though. One of the things the utterly blew me away was the amazing support we had. I never thought cycling for several hours a day would generate much interest, but the amount of people who got behind us which helped us on our way was truly great, from messages and donations through to joining us for part of the ride or for a few days, it was incredible and it really gave us a great lift. You'll probably not appreciate how much you helped us keep those pedals turning, it really did help. The fog on the final day! Marquis Motorhomes - we had an amazing time in Herbie Swift, a cracking campervan, plenty of power and a great base. Waking over the shores of Loch Fyne was fantastic, a really memorable experience and we were sad to hand Herbie back. No wonder Marquis are the biggest, they certainly were the best! 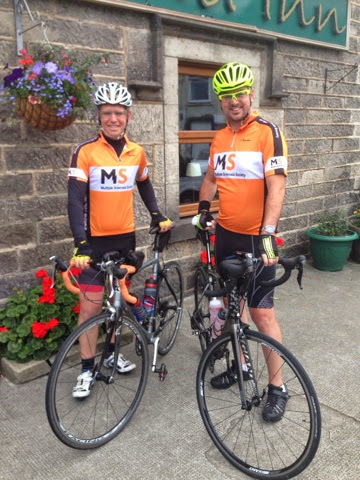 Decathalon Bolton - our printed cycle tops were quality, we really looked the part in them, brilliant. Day 12 - What have you done today? A strange feeling at the beginning of the day, I haven't got much of an appetite. A mix of apprehension and excitement turns my stomach as we load the bikes on to Brendon's car for the final time, somehow i feel sad we're doing everything for the last time, but every part of me cannot wait until this is over! The 15 mile drive to Brora, where we finished last night, is a quiet one, silent contemplation of the day ahead, some mental preparation. Odd really as it will be our shortest ride by far, a breeze compared to everything else that has gone before. There's a few people gathered to see us off, Mum, Chris and Rob gather round to take pictures and very soon, we're off! I can't really remember the first 10 miles now, it was very 'up and down' I know that much, progress was painfully slow as I wished and willed the miles to count through more quickly on my Garmin. I start thinking about the last stage of the Tour de France. The winner is effectively decided on the penultimate stage, the final stage is more a procession, am easy saunter up the Champs Élysées. At about 12 miles Mum and Chris pass us just after a roundabout. We can see a huge climb stretch out ahead which then bears right and climbs still further. There's one thing I've learnt to accept over the last few days is LEJOG isn't going to roll over and have its tummy tickled, we're going to have to fight every step of the way. We climb nearly 800 feet into thick fog, it's hard going, it begins to rain. The fog is a bit of a worry, visibility is severely reduced, the prospect of it all ending early due to a careless, hurried driver is all too real, and seeing how things went yesterday, it's all too realistic. We carry along the top to the hill for sometime before a steep descent followed by another steep and winding climb. The support crew catch up with us just after the summit and it's a good time to adjust our light and put on waterproofs, the rain has now picked up as has the cold wind. Lovely for August! Brendon and I are quite relieved to had the team follow is for the next 5 miles through the fog! The support crew push on and we then knuckle down over the next 7 miles to the final feed stop of LEJOG - beef and horseradish sandwiches await! With all the major hill climbs out of the way Brendin and I can really go for it on the final 32 miles and we average something like 18 mph. I'd be lying if I didn't find the final push emotional, occasional waves hit me, Heather Small strikes up her lyrics every now and again, images of Lisa and my dad play through my mind as do images of the epic journey and the moments we've had. All these thoughts seem to push me on, in fact, we go so fast we get to the finish line ahead of the support crew! Luckily everyone rallies around shortly after and we can take some pics. So, this is nearly it for our little adventure, we've done the cycling, there's a long journey (in Herbie Swift) to return home and then things will start to get back to normal, I'll be able to sit comfortably on my bum, Carla will stop force feeding me porridge, Helen will stop getting our journal stamped at campsites and you and I will no longer share this dialogue. I'll certainly miss sharing these thoughts with you, the highs and the lows. It's been fantastic having you along for the ride with me, it's felt to me as though you've been pushing me along when I've struggled, so a heartfelt thankyou from me for that. I've enjoyed having you as my riding buddy! I hope I have inspired you in some way, and if I have, whatever challenge it is that you plan to face, let me know, I'd love to hear about it and cheer you on to your success. It may well be tough, but just think of me, an ordinary guy who picked up a bike and just went for it, I'm the living proof that you need that it is possible - so go for it, make yourself proud. It's getting close now isn't it? We had a lazy morning at the campsite, with a cooked breakfast and who knows how many cups of tea. It was my birthday today, I woke up to lots of lovely messages, but with the ride ahead, it just didn't feel like it. 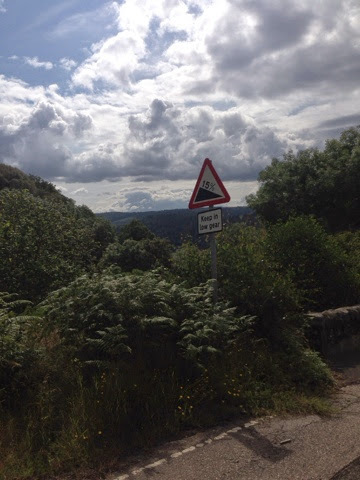 In someways I had a bad feeling about the ride ahead which was disconcerting. The route took us along the western bank of Loch Ness heading north for 18 miles to Dumnadrochit. 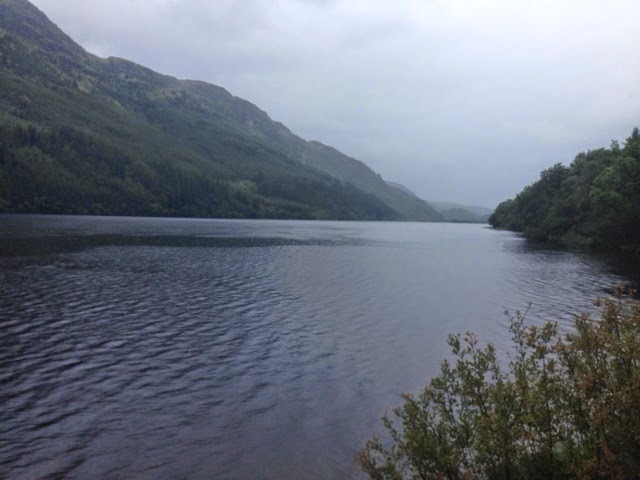 The views of Loch Ness were amazing as the route climbed and dipped and we made some very good progress. I guess you'd expect me to be full of beans on a day like today, the finish line is getting near, it's my birthday etc but I just didn't feel like it, perhaps it's road weariness, but I really battled psychologically with the ride. It was great riding with Brendon today though, he allowed me to ride out in front and stayed close by as we nattered about this and that. I turned my thoughts to more positive things, what we're doing, seeing Paddy and his mischief on day 2, how lucky we've been. Despite going well the miles were seeming to drag on, I guess getting close to the finish, they would seem to. As we reached Drumnadrochit we turned left and climbed up behind the town in one of the toughest climbs to date - over 1 mile of 15% gradient! A really tough one. A rewarding climb and perhaps just what we needed to get us going. It was followed by what seemed like several miles of steep descents, they were amazing as we hit nearly 40mph at points. There was one nerve wracking bit as we descended through a narrow avenue an artic' truck passes from the other direction, the backdraft from the truck was really powerful and caused my bike to wobble! 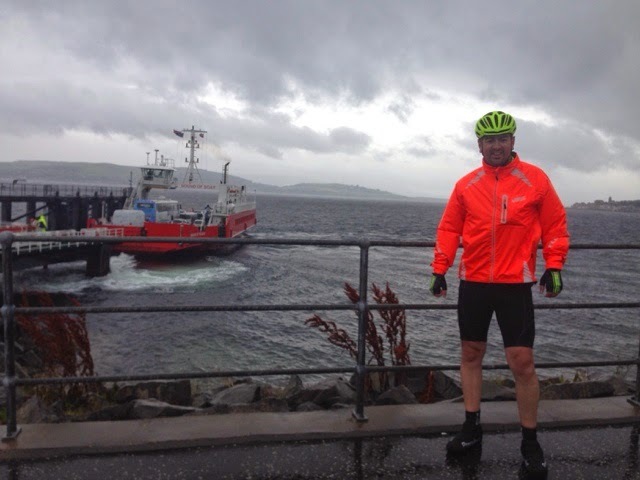 We headed across country heading north of Inverness towards the A9 and our first feed stop of the day on the bridge of the Firth of Cromarty at 43 miles. The A9 at this point is a terrible road, very busy, full of cars and lorries in too much of a hurry, many of whom happy enough to get too close. The road is in an awful state, we juddered and bumped along, I'm now sporting blisters on the palms of my hands and highly unusually, Brendon had to stop after 10 miles because the vibrations were making his wrists ache. To add insult to injury, the North Sea wind was blowing in our face, the ride was turning out to be a bit of a nightmare, not an enjoyable way to spend your birthday! Progress was slow and painful, my quads began to seize up again, cars whizzed by with inches to spare and cycling uphill was incredibly tough. Fortunately we turned off the A9 after 15 miles, well over an hour of battling energy sapping conditions, and on to some back roads. At about 60 miles down Brendon and I both chatted through the progress, we would both have been happy to call it a day at this point, it really wasn't enjoyable and we both just felt flat. We pulled over for a quick drink and so I could massage and stretch my troublesome quad. I could literally feel the rightly bunched muscle creak as I pedalled. 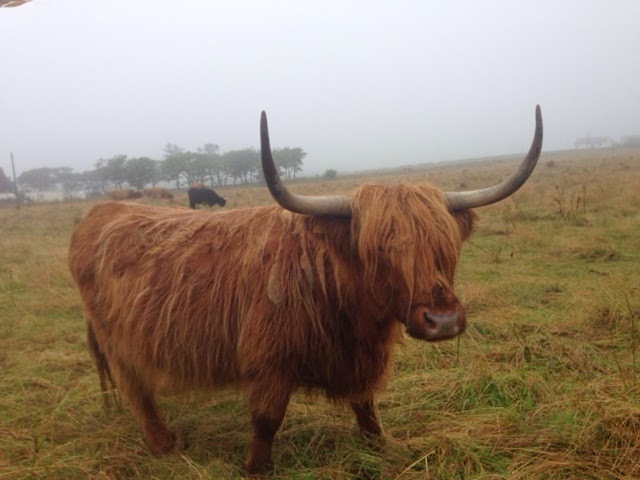 Thankfully we only had a few more miles for me to limp on until our next feed stop - the Glenmorangie Distillery! What a cracking place to stop off - Rob was in full on holiday mode as he purchased a 3ltr bottle of whiskey, a pourer and an umbrella! A deep massage and a few drinks and we were on our way to complete the last 21 miles. Most of them were in to a strong headwind and uphill so they passed slowly, but then we started to see signs for JOG, less than 100 miles away! Yippeee! My mum and Chris we're we're joining us for dinner having travelled up from Aberdeen where they were visiting family so there was much to look forward to. I almost began to feel a tinge of sadness that this great adventure is now coming towards an end, but then I quickly remembered the pain and agony I've been in as 13.5 hour days in the saddle slowly past by. I'll not be sad to complete the challenge, but I'll hold on to some great memories of achievements, great support, laughs and giggles, overcoming adversity and raising a good wodge of cash in memory of some fantastic people - and when I finally had a chance to settle on that thought, I realised that alone made it the greatest day! Have you ever just enjoyed a hot shower so much you don't want to leave it, you could stay under the cascade of hot fresh water forever, it feels fantastic. It certainly felt like that tonight, despite there being barely any power in the shower and having to push a button every few minutes to turn it back on! Not the best shower system ever, but it still felt like a dream! In some ways it was a shame to leave Inverary this morning, a beautiful place and The Argyll Campsite was a stunning place overlooking Loch Fyne, but we packed up and were ready to go at 0930. The rain had returned so it was another wet start, things were grotty for the first few hours. Nevertheless, we made good progress as we tracked up towards Oban, covering the first 30 miles in a little over two hours. If you've never been up the west coast, you really ought to make a trip, the scenery is so stunning it can almost distract you from the aches and pains of riding to it from Cornwall. We snaked up the coast, the road skirting various sea lochs and inlets, a bit of a windy route, but fantastically enjoyable. It seems the local traffic don't enjoy cyclists as much, so we got the odd bit of abuse hurled at us from passing cars - nice! We arrived at the first feed stop ahead of the girls, it's quite nice to actually be riding well enough to be ahead of the game, so we continued on another 5 miles to a small village shop at Onich where we stopped for a few minutes before the girls arrived. I couldn't go on any further, my quads had cramped up terribly and I was finding it difficult to pedal, Carla came to the rescue with a leg massage! On a brighter note, having moved the position of my cleats the pains in my achillies did not seem to interfere, so despite the intense cramp, I was in a better place physically and able to enjoy the scenery. Having pedalled further on the first leg it was only another 20 miles until our next feed stop! What a bonus. 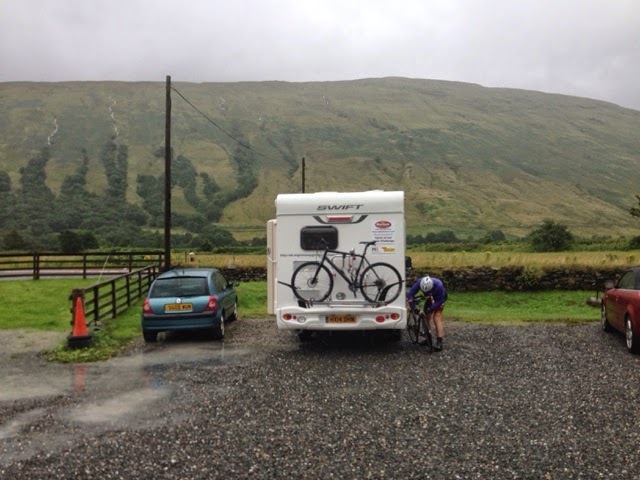 We cycled the 10 miles or so to Fort William which is practically at the feet of Ben Nevis, then headed along the Nevis range towards Spean Bridge and the Commando Monument which looks back all g the valley towards the Nevis Range. Amazing scenery, perhaps just reward for our cycling to date. After about 10 miles or so my legs cramped up again. It was a real struggle to pedal, I could actually feel the tight muscle in my left leg creaking against the movement I was trying to make. 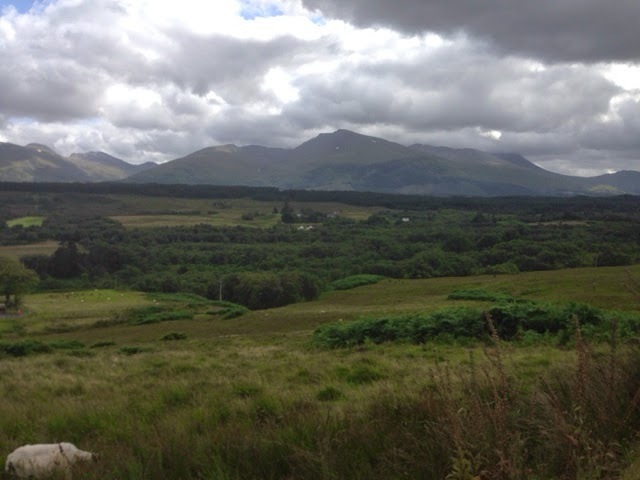 There was a long climb up to the Commando Monument where we were able to sit for a whole and look back at the Nevis Range and absorb the view. I worked on my quads whilst we waited for the girls - we'd managed to beat them to the second feed stop too. 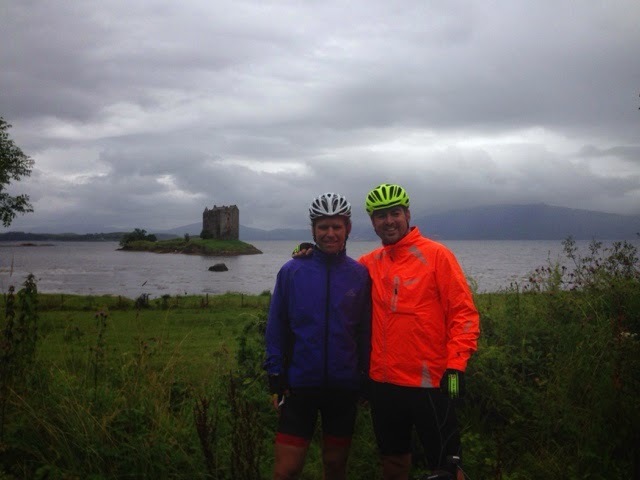 The last leg was another 20 mile stint to Fort Augustus, at the foot of Loch Ness. 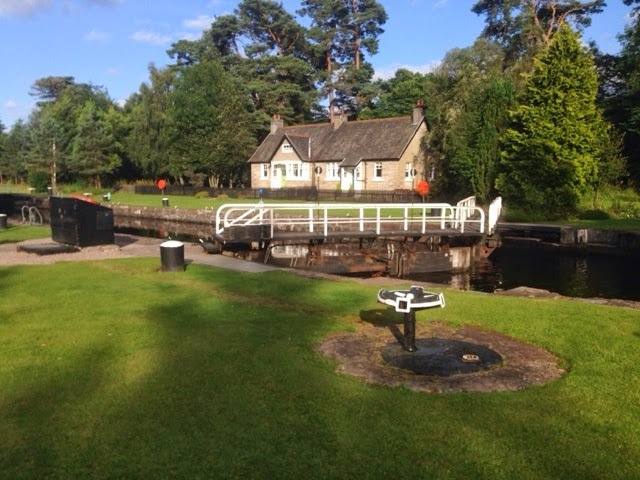 The route was mainly downhill, followed by a few miles of canal path to our campsite. The much maligned midges we there to greet us, clouds of them were along the canal side and their favourite trick was to fly into my eyes as we cycled along! A big bonus was that our friend, Rob Shelswell, had flown up from Southampton and driven a hire car from Glasgow for 3 hours to spend the rest of the trip with us! Great to see him and he gets hero of the day for making the effort. Today's been a fantastic rest day, we awoke on the banks of Loch Fyne, which was mill pond smooth this morning, an absolutely beautiful setting and definitely worth a visit. I'm not sure my iPhone camera does it justice, but hopefully you get the idea. It was a rest day with a twist, as it was also Carla's birthday. Perhaps not the way she'd choose to spend her birthday, but I think it's testament to the fantastic support that she has given me through this epic adventure, from the very start through to the culmination of activities now - I'm a lucky guy! 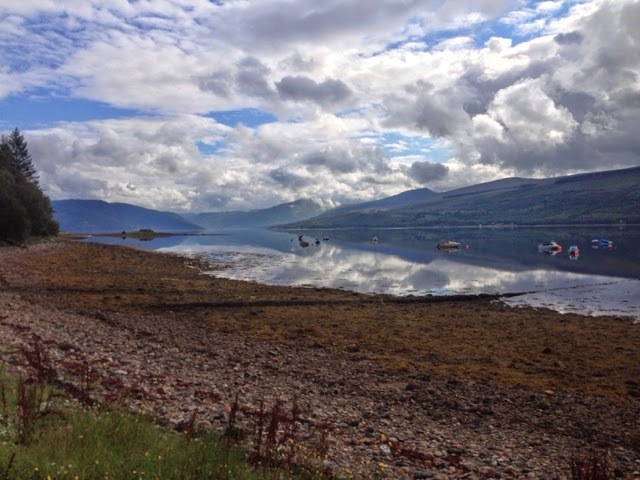 We spent the day relaxing at Loch Fyne Hotel & Spa. Ordinarily I would be keen to explore the local landscapes and sights, there seems to be quite a lot in the beautiful place, but we've all been content relaxing. I had a fantastic massage which has loosened me up, I was struggling to walk properly, the girls also had a massage and chilled by the pool. This evening we all gr together at Loch Fyne Restaurant, it's a small private enterprise and not the high street chain, some amazing food and a great way to celebrate Carla's birthday. So, tomorrow we head on to the base of Loch Ness, we'll cycle past Ben Nevis and I'm told we will have some amazing views. It's another 92 mile ride, so it will be a test, thankfully it's reasonably flat and will only rain a little at the start and then ease off. Whatever the weather, distance or hills, I'm blessed to have the support of an amazing wife. Happy Birthday Carla and thankyou for going wherever I will go! We're up and raring to go at around 10am, I say raring to go, it's more like something out of a zombie film, going through the routine of bike prep, heading out to the start point, getting on, getting going. Today's the last day in the saddle before a rest day, we need it, badly. Before we head out, Brendon has jumped ahead in the puncture stakes 3-2, a loud pop from his tyre can be heard from Herbie as Brendon fidgets outside ahead of us getting up. We head on A roads from Kilmarnock to Saltcoats, where we stayed the night before. After 14 miles or so half a dozen seagulls issue a piercing call to announce our arrival on the west coast as we trundle through the town. A dreary place, downcast much like the weather which has been grey and sodden since we started. We pedal along a coastal road, past a penny arcade and shabby buildings, the town appears depressed, perhaps it's the constant tip-tapping of the rain bringing it down. We pass a grotesque green attempt at crazy golf as it waits patiently for customers that will never come, this town is well past it's best amd we're glad to head out of it. Two seagulls bow mornfully as we head on through. Both my achillies and my right knee are uncomfortable from the off, it's a 91 mile day so it'll be a while before I can get off the bike, I can't push hard to finish quickly at the risk of injury, I just have to put up with it. Rain pours constantly, we're drenched, it's an appalling day. I think of log fires, comfy sofas and lazy days that weather such as this inspires, my achillies prevent a full day dream developing which is just as well, the thought is too seductive and we need to just push on. Thankfully the course is relatively flat as we head up the coast in search of the ferry to Argyll. The girls fly past occasionally and hurl encouragemt at us, the rain is torrential and they recognise we need a boost. Strong winds try to push us back, occasionally we face violent gusts, this is not pleasure cycling by any stretch, this is just about covering distance, getting it done, a means to an end. This is more November than August! Soon we're at the ferry, 42 miles done at a good pace considering the driving rain the the blustery headwind that has built up. Grit teeth and get to the finish, I'm not seeing the scenic west coast that I'd hoped for. As we head off on the other side both Brendon and I shiver with cold, my teeth chatter. We're concerned the cold may set in, conditions are rough and getting cold could be problematic. I struggle to turn my legs over, I think it's psychological, but I have issues when I try to sit down and pedal, for about a mile I have to stand and cycle before I can bring myself to sit down, the pain in my knee and achillies is making life tricky, but we're nearly halfway and it took just over 3 hours to do the first leg so we're doing well. 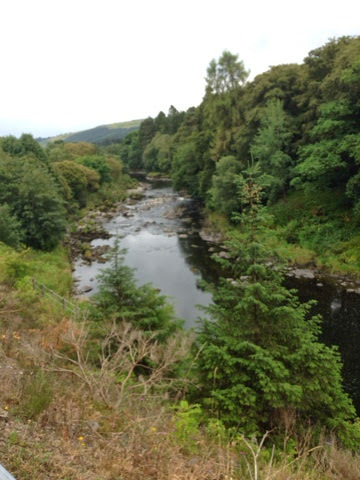 The road to Argyll runs alongside a loch, the surrounding hills are as picturesque as the Lake District and take the edge off the driving rain. Thankfully we are somewhat sheltered from the wind so we make good progress as we head towards Loch Fyne and our next stop at 72 miles, the original Loch Fyne restaurant (not part of the chain) about 10 miles outside Inveraray. There's ups and downs but nothing too horrific as we head down one side of Loch Fyne before rounding the top and heading down towards the restaurant and the welcome respite of Herbie. It's tempting to stay put in Herbie, comfortable, warm and dry. We've been cycling into rain constantly for six hours, some sort of excuse to finish would be easy to find now, but we just need to compete another 19 miles into Inverary and then a long climb back out towards Oban - the trick is not to hang about and indulge the thoughts of being dry, being relaxed and being rested. We push on quite quickly over the last section and manage to finish by 6:45, one of the earliest finishes to date, a huge relief and a great sense of achievement. Tomorrow is a much needed rest day followed by the last 3 days of LEJOG - it feels like we're getting close, but there's a way to go yet! We were up and about relatively early on day 7, but there was little in the way of spring in the step, we were like battle weary soldiers and were not rushing to get to the front line! We were ready to go around 0930, we loaded the bikes onto the car and Katie dropped us off in Great Orton and we were soon ready to go. We donned the waterproofs, rain was forecast and it had already started to drizzle. In my tired state I'd not set up the Garmin properly (our satnav) so we got off course pretty quickly. Brendon as ever kept us on track by navigating using the iPhone and a OS map! Before too long we were in Scotland. There was a sense of relief that we'd made it, although in reality it was only just over halfway. To greet us, the rain started to pour hard - lovely! To keep ourselves entertained we took turns to hum tunes whilst the other guessed what was being hummed. A silly game but then you need something to take your mind of the ride when the miles tick over quite slowly (about 1 every 4 minutes). As the rain poured even harder still the games gave way to us putting our foot down to try and get to the first food stop at 46 miles as quickly as possible. Effectively you're riding on your own in these circumstances so you need to turn your attention to something else to pass the time. I sang along to myself (I never normally do this) and played games with the mileage, counting down multiples of 10, multiples of the journey to our rest stop, anything I could think off to break the journey up and keep the carrot waving in front of me so I kept pushing on. We arrived in the small village of Auldgirth where the girls had found a small store and tea rooms. We were doing well time wise so indulged ourselves with a cooked breakfast - I decided for the works which included haggis, and it was polished off in no time. If you're passing by, I recommend you stop in, Kava is a great host and made us very welcome! So far there was no pain other than the usual aches and niggles and we were well on track for a good time. It's always tricky to get going after a stop though and the legs were stiff as we pedalled off. My achillies was painful in both legs which hinders me as we push on for the rest of the 40 mile climb (yep, 40 miles of climbing!) through the hills between Dumfries and Kilmarnock. Thankfully the rain eased off and stopped so as we pedalled on we play silly sods again. As we passed one field I 'mooed' loudly to the cows, quite excitedly they ran alongside us for a while until a wall halted their progress. They looked on disappointed as we continued on our way, it was tough going with the constant climbs so it was nice to have a little bovine support! The scenery was impressive, but I wa running out of batteries on my phone to take pics, sadly the rainwater had swamped my extra battery which decided not to work. Here's the best I could do. Fingers crossed it's back online tomorrow as we head up to Inverary! The feed stop on 76 miles could come soon enough (a recurring theme), I was flagging badly and the constant aching of both achillies meant that I was incredibly keen to get off the bike. Add to that the free Scottish massage we were having en-route - there are several poor sections of road where we just juddered along the tarmac, it slowed progress and added to the discomfort. The girls were waiting for us at 76 miles and looked just as tired as we are. Nevertheless they rushed around getting us drinks and treats to perk us up again. We struggled to move off and rested up a little longer than planned - there's something about the level of weariness, we knew it wasn't good for us to hang around but we just couldn't help it, these brief windows of rest were a delightful oasis in the painful trek across Scotland. We had just 18 miles to go until we hit the outskirts of Kilmarnock and the end of the day's ride. A glorious descent from the 40 mile climb lulled us into a false sense of security as several long and step climbs followed. We stopped for a quick pic outside a Robbie Burns monument before we pushed hard and time trial rode the last 10 miles at a good pace. Before long we were loading the bikes on the car and heading back, both stiff, both aching - dinner and bed beckoned - one more ride until rest day.